I’m not sure what numbed my nerves and gave me confidence to become a lyft driver especially being an introvert! I just remembered being anxious from not working and YouTube videos of Uber/Lyft sounding cool and I was up for the challenge. So I applied, submitted my information , and a few days later I met with a mentor so they could give me a heads up on things and evaluate my car. A couple of days flew by ..maybe a week or two and I finally got the notification of being approved to drive, yayyy! Full of excitement and readiness to chauffeur the world , I switched my lyft app to ‘online’ to let people know I was available. I then decided to look at YouTube videos of the do’s and dont’s with lyft . Within 20-30 mins. of being ‘available’ I received a pickup request! All of my excitement went away and reality reminded me of the fact ” you do know you just made yourself available to pick up strangers in your car, right?” I immediately switched my availability off …for like a month lol . I know , why go through the emotions ? Well , I liked challenging myself to converse with people and it was a different kind of experience . So one Saturday I finally decided to move forward with the process. I picked up two ladies that were on their way to a college football game. On the way there they mostly talked amongst themselves which was great for me because I didn’t know what to talk about and I wasn’t a big sports fan. The last few minutes we spoke about marriage and the ‘stress tooth ‘ ball I have in my car that reminds me to stay focused on dentistry. Very random but smooth first lyft ride! I recommend for all my brave introverts :-)! As my wedding countdown continues I thought it would be nice to share some of my financial experiences living by myself . Coming from on-campus with roommates to having an apartment by yourself was awesome-sauce ! That’s a post by itself. So anyhoo, I have this awesomesauce apt and a science-related job literally right after graduating from college. The pay at first didn’t seem bad but I didn’t know how to manage . I needed a lot of things for my apartment, a car, take care of bills and myself. My family was very supportive but I knew I needed to be smarter with my money. Instead of buying everything at one time , I would buy things over time . For example , before I was able to get an actual sturdy bed I got a cheap blow up bed so I could save my money. Before I was able to get a couch , my apt has a bar so I bought bar stools first. If you think about it its like looking at a painting’s minor detail before appreciating the masterpiece. Next, I needed focus to be my best friend especially once I locked my apartment and would go shopping and out to eat. It’s like going to the grocery store hungry …Don’t DO IT! When I noticed my careless behavior I started writing out a “Things to Do” list. If the mall wasn’t on my list , I couldn’t go to the mall. I disciplined myself to only follow that list because I was now at a point where after I took care of my upcoming list of bills I could do other things if I needed to. As far as my bills, the costs were pretty consistent even though my rent started increasing slightly. One of the bills I had control over was my electric. I knew I didn’t have money to pay crazy electric bills so since I worked at night I made sure not have my a/c on when I’m not home. During the day, I used natural light so I only use lights when I needed which was mostly in the nighttime. I spoke with a representative at the electric site and she mentioned when you keep your thermostat between the range of 60-65 , your bill remains about the same. Doing all of this consistently and paying on time allowed me to not pay my electric bill for over 6 mos!! Seriously! I had to call and ask why it said “-50.00” and the representative told me how I accumulated credit or something…also known as favor! Groceries , I’m still working on being a coupon queen but besides that I like to look at the circular to see what’s on sale and kind of use that as my foundation of what I’m going to eat for the week. I have lots to still learn but I wanted to share my experience and to let you know you can be bad all by yourself! Yayy!! I finally have my diy wedding dress!! Just so we’re on the same page this diy is not a do it yourself but dont intimidate yourself , lol. Let me tell ya weddings are /can be expensive and my vision in life isn’t on the cheap side either! So that being said , one of the exciting moments for a future Mrs is getting that special wedding dress. I watched bridal shows , picked up on dress lingo and felt like I had it all in the bag except for one thing….money. 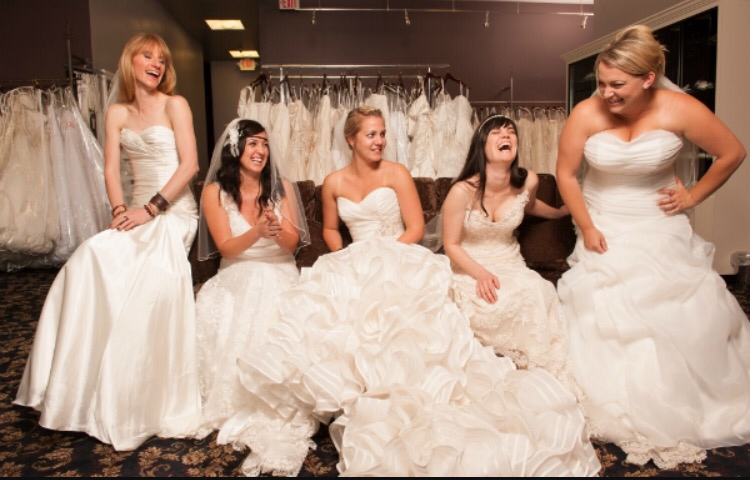 I started going to different bridal shops and it was overwhelming with beautiful dresses. Even though I didn’t have the money to get the dress I really wanted I knew I couldn’t show that to the consultants , I needed faith and a poker face . I later found a dress that complemented my slender shape and everything! The consultant thought I was getting the dress . As she walked over with a poster and bell she asked ” so do you say yes to the dress? !” I smiled staring at myself and said “oh no no ” lmbo. I was frustrated because I needed money . My wedding planner gave me the idea to look into online dresses but also said because my time is winding down it may be a risk. My options were few and I took that chance. I started researching and my grandma looked as well. We had to sift through the scam sites and find one that was reliable, that was when I found preownedweddingdresses.com . This awesome site worked wonders for me. You can filter by size , silhouette, price , color , you name it and I’m sure they got it. After stalking the site for several days, my grandma found a Maggie sottero dress for $200! I contacted the seller and basically interviewed her for a couple of days ( I have to make sure lol ). I asked for more pictures of different angles, asked about the material of the dress , condition of the dress and everything. Luckily, the lady was patient with me because I knew I asked over a million questions. I finally paid through PayPal and received the dress about a week after . It’s just like the photo , needs a little bit of alteration but it’s beautiful! So wherever you’re at in life, remember God’s got your back and when you don’t have a logical way to get from point A to point B use your faith . Trying to recover from the holidays? Having a hard time coming up with a way to pay your bills effectively ? Well, you’re definitely not by yourself. One of my challenges after graduating college was learning to become independent , especially financially. I had to get my priorities in order quick and adjust to life’s demands.. bills. I can honestly say I have a good system going when it comes handling bills but there is always room to grow and build to my vision while tackling bigger expenses , like student loans!